Make this simple No-Churn Peanut Butter Cookies and Cream Ice Cream. With only 4 ingredients this couldn’t be any easier! Plus, no ice cream machine is needed! Today we have another special guest her on Beyond Frosting. 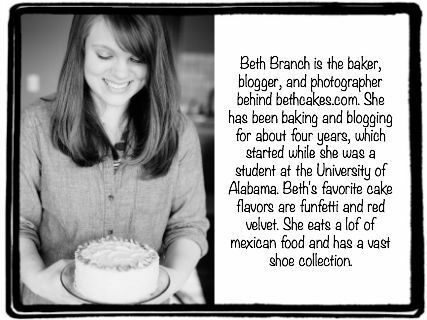 Please join me in welcoming Beth Branch from Beth Cakes. I first became familiar with Beth last year when I saw her amazing posts over at Best Friends for Frosting. Both her Funfetti Hi-hat Cupcakes and Lemon Meringue Doughnuts were absolutely stunning! 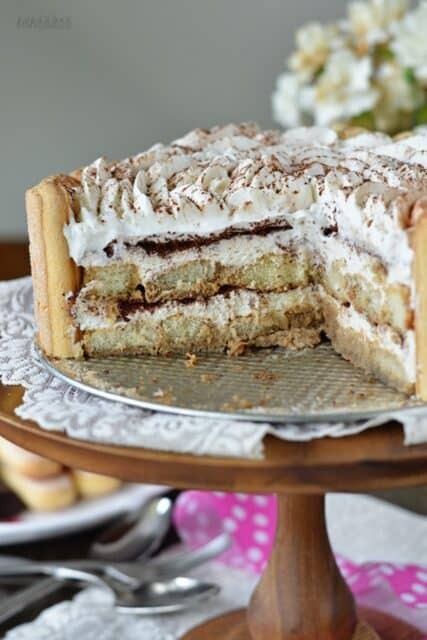 More recently, Beth has been wowing me with her Icebox Tiramisu, Funfetti Yogurt Popsicles and No-Bake S’mores Nutella Pie. 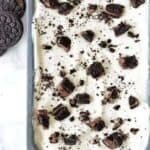 Beth is so talented and I am thrilled to have her sharing this No-Churn Peanut Butter Cookies and Cream Ice Cream today! 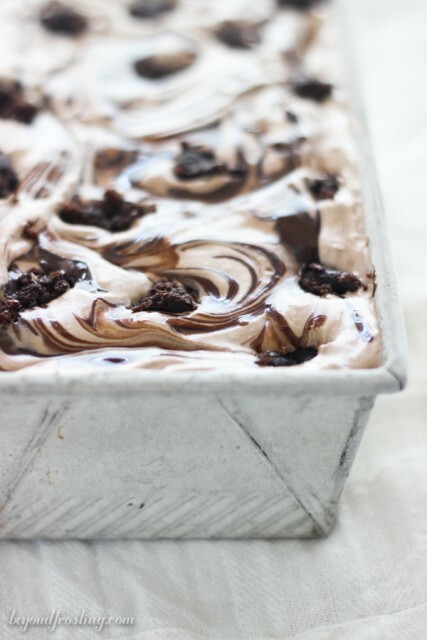 Today, I am extremely excited to share this ice cream recipe with you! I made no-churn ice cream for the first time a couple weeks ago, and I immediately understood what all the hooplah is about. Not only is the base two ingredients, it’s actually really good. I mean…it’s sweetened condensed milk and whipped cream, but I was a little skeptical of it for some reason. And now, I already know I’m going to make more and more batches as the summer goes on. If you know me at all, you know that I LOVE Oreos. 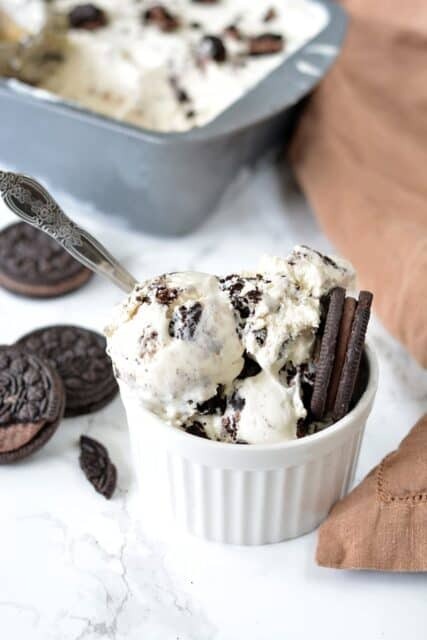 I bake with them all the time, and now that I’m in this ice cream phase, it’s really not surprising at all that I’ve got a cookies and cream ice cream for you today. BUT. What really makes this ice cream? I think it’s the Oreos paired with the peanut butter base. It’s just SO creamy. When I first tasted it, the ice cream had been sitting out for about five minutes. It was ever so slightly melted around the edges and the Oreo pieces were so soft. And then I professed that this might be the best thing I’ve ever made. Yeah, that’s how seriously good this stuff is! I went with chocolate creme-filled Oreos for this recipe, but you can use regular creme or even peanut butter creme Oreos if you’d like! The easiest way to create the peanut butter base is adding the peanut butter to the sweetened condensed milk and folding in the whipped cream, as opposed to trying to fold the peanut butter into the whipped cream. That would be a lot of arm work for sure. And that is not what no-churn ice cream is about. 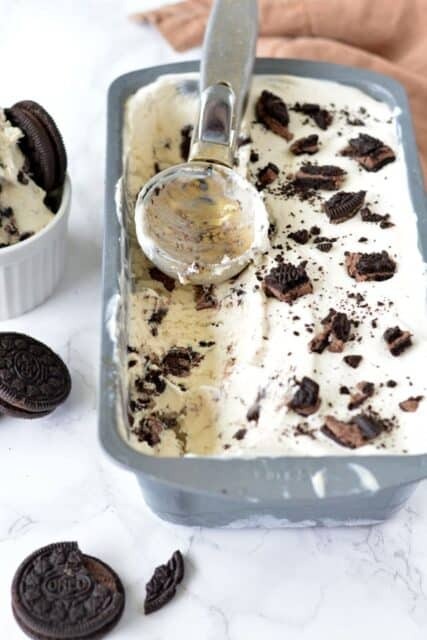 The hardest part of making frozen treats is always waiting for them to freeze so you can eat them, but this ice cream is totally worth the wait! It’s the perfect creamy and cold treat on a hot summer day and it couldn’t be any easier! Whisk together the sweetened condensed milk, peanut butter, and ¼ cup heavy whipping cream in a bowl. Set aside. In the bowl of a stand mixer with the whisk attachment, whip heavy cream on medium-high speed until stiff peaks form. Fold in half of the peanut butter mixture until incorporated, and repeat with the second half of the peanut butter mixture. Add a layer of the peanut butter mixture to a 9 x 5 inch loaf pan. 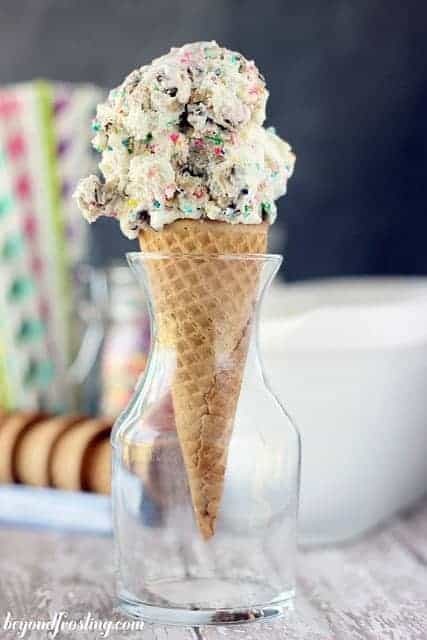 Sprinkle with chopped Oreos. 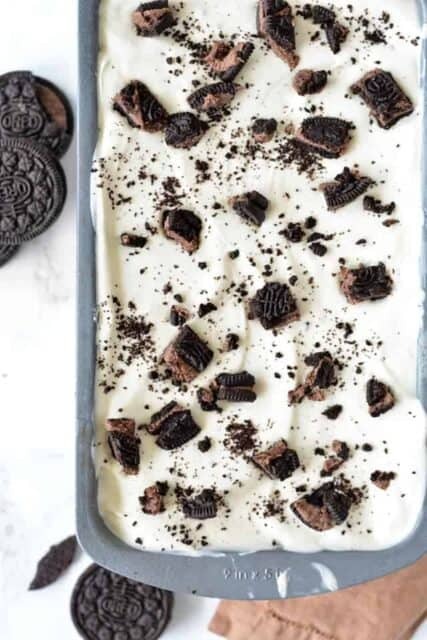 Add another layer of the ice cream base and Oreos. Repeat layers until the loaf pan is full and top with chopped Oreos. Freeze for 6 hours or overnight. 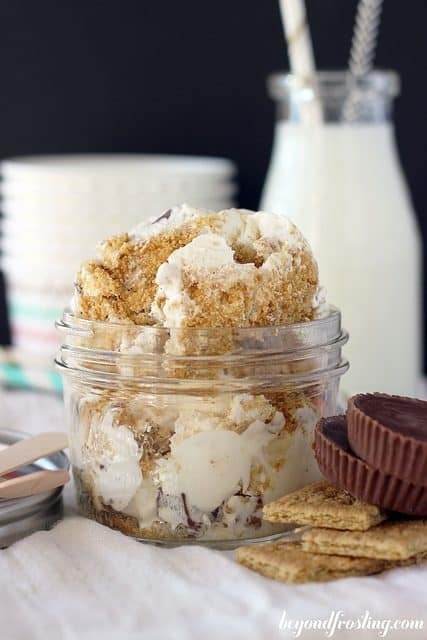 This looks amazing but I do not have a fondness for peanut butter. What might be a good substitution for the peanut butter? I’ve been thinking and thinking and can’t come up with anything. Thanks! Hi Donna, what about Nutella? Do you like Nutella? That is an excellent idea. Thanks! What a fantastic combination of peanut butter and cookies! 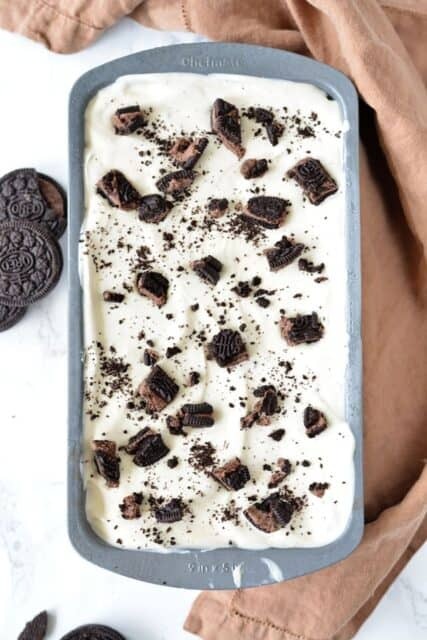 You know how I feel about peanut butter, and cookies and cream ice cream is my FAVE! 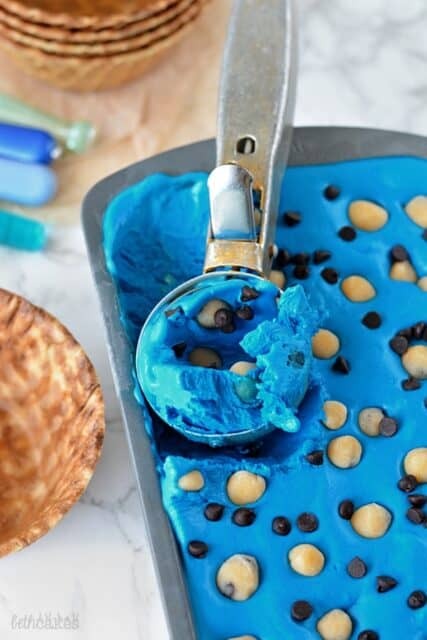 I NEED this ice cream in my life! Looks absolutely incredible Beth! Love those pics! Two of my favorite things in the world ar Oreos and PB. This ice cream rocks. Great guest post, Beth!